Puri, renowned through ages for its great monuments of superb architectural beauty and dotted with innumerable holy shrines,has its own typical crafts which have survived through many generations of artisans.Among the many arts and crafts of puri,special mention may be made of stone carving,applique work,wood carving,mask making,palm leaf engraving,terracota,patta chitra painting and thermocool work. In the ornamentation of the hundreds of temples,monasteries and other works of stone which were built in the course of many centuries in Odisha,the carvers acquired the most extraordinary technical skill in architectural decoration.The work of stone carvers of today does not fall much behind the high artistic excellence reached by their predecessors. At present a few families still continue to follow the age-old tradition of creating artistic figures and images on stones of various quality. Most of them work on soap-stone and some on sand-stone and hard-stone. Pathuria Sahi in Puri is crowded with houses along narrow winding alleys wherein live the descendants of the builders of the temples of Puri, Bhubaneswar and Konark. The products are very fine and beautiful in quality and are highly appreciated by foreign tourists and people coming from the other parts of India. The wood carving of Puri is worked in a style, blending folk and classical forms with a special feature of colour paintings on the wooden objects. 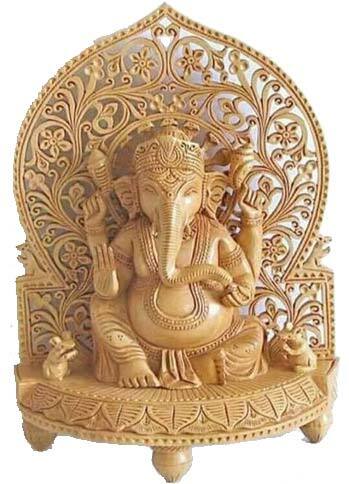 A variety of decorative and utilitarian objects like toys depicting birds and animals-real and mythical, dowry boxes and bowls are fashioned by the carvers. A combination of skill and folk and classical styles makes these objects unique in the field of Indian handicrafts. Various types of decorative articles including masks are produced from Sola pith and papier-mache. The pith decorations are traditionally used to decorate the images during various festivals. Beautiful toys with detachable limbs like nodding tigers, other animals and different types of masks are made in papier-mache by the folk painters of Puri. A co-operative society has been organised for this craft at Puri-town. The palmleaf illustrations are mainly of two types, simple engravings or illustrations in pure line on palmleaf and engravings with colour fillings. The majority of the illustrations are in the line only. Plamleaf illustrations are executed on oblong palmleaf. When these are intended for a manuscript they are bound together with a thread, passing just through the middle of the leaves. Palm leafs are also used to draw pictures of different Gods and Goddesses. These are joined lengthwise with the help of threads to form a rectangular or square format. These could be folded and opened or could be hung on the wall. 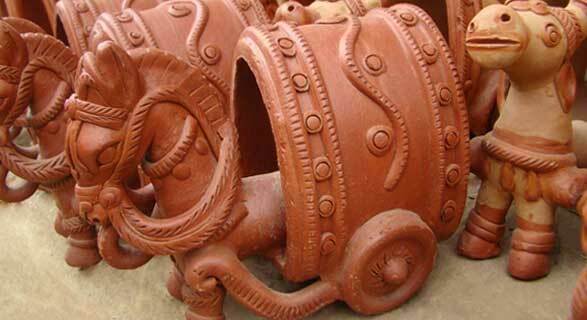 Terracota is an art form universal in its scope,yet emblazoned with the distinct imprint of the native soil.The art of kiln burnt ware,graceful and harmonious,provides the perfect counterfoil to the amazing legacy of stone sculpture. There is one particular section of pepole,skilled enough,follows the footprint set by their ancestors.Apart from supplying the earthern pot for the daily requirements in the temple the Kumbharas dedicate their entire time in carving out different images from clay.These category of pepole reside in a particular area called the 'Kumbharapara'. Chitrakars or folk painters of puri and Raghurajpur belong to an indigenous school of painting which dates back to a remote past.The age-old tradition is still preserved by the chitrakars and their women folk. The Patta or the canvas is being prepared by coating the cloth with a mixture of chalk and gum made from tamarind seed,which provides a leathery surface to the ground.On it the painter draws directly with his brush,with light Indian red or yellow and then the forms are filled in with earth and stone colours,mainly with yellow,blue,red and white.Patta-chitra,though basically a folk style,has been influenced by classical Odishan sculpture forms.The subjects depicted in the pattachitras mainly cover major Gods and Goddesses in the Hindu pantheon,familiar episodes in the Radha Krishna legend and Jagannath, the chief deity of the land. Thermocool does gain its proficiency in the hands of the traditional dexterous artisans.In every religious function craft of thermocool are used for decorating the platforms.Especially on Jhulana yatra,the mukti mandap or the platform where the deities swing as a part of yearly rituals is decorated with thermocools in different forms.Similarily in Dussehera the idol of Goddess Durga is given a colourful shape by using thermocool for its necklaces,embroderies etc.Even during the annual Ratha yatra when the deities used to come out of the main temple for a ten days holiday to gundicha temple,use the same called as 'Tahiya' which is supplied by Raghava Das matha of Puri.Even since the beach festival started,the great wheel of konark, temples of Puri, Bhubaneswar etc. are modelled out in thermocool which attracts the tourists most.